Let’s say you have code that in some test cases you want the real code and other test cases you want a test double. In C, using link-time binding, you only get to have a single function with a specific name. I’d suggest that most the time this comes up you want to directly test some module (or function) and you want a substitute when testing code that depends on the module’s interface. Create multiple test runners, where one test runner would use the real function and the other test runner would use the test double. #include the .c file in a namespace in the test file. This might be a decent solution. Though it can lead to needing many test runners. Changing a direct function call to an indirect function call is a small change, and the compiler and linker will make sure you get it right. There are a couple examples in my book, in chapter nine. Here’s one of them. That refactor is pretty easy, but you must make sure all users of RandomMinute_Get() include the header file. If you happen to be lazy about calling functions without having them advertised in a header file, the caller will think this is a direct function call. Bad things will happen. In the test group file, write FakeRandomMinute_Get(). in setup() override RandomMinute_Get() with FakeRandomMinute_Get(). UT_PTR_SET overrides the function pointer and then restores its original value after teardown(). Your code under test now has predcitable random minutes. In another test group, the production RamdomMinute_Get() function can be tested without overriding the function pointer. But maybe you don’t want to use a function pointer. You might prefer this next solution. In this solution, the test-double’s function name in FakeRandomMinute.c is the same as the function being faked, business as usual for link-time substitution. To test the production implementation, the the RandomMinute.c file can be #included in the test file. In addition, the #include needs to be wrapped in a C++ namespace to keep the name out of the global namespace. In the test cases, make calls to Test::RandomMinute_Get(). The linker tricks are not generally available except from gcc. I’ve experimented with wrapping in gcc., but could not find it in visual studio or IAR (at the time I looked). The linker will redirect calls to RamdomMinute_Get() to __wrap_RamdomMinute_Get(). You can get at there production implementation by calling __real_RamdomMinute_Get(). You need to provide __wrap_RamdomMinute_Get() to hold your fake implimentation and to keep the linker happy. Maybe some test cases want the real RamdomMinute_Get(), you could make the wrapped function default to the real with function. I chose to use a function pointer for test specific behavior. This lets you have a generic fake implemention that is customized close to your test case. I’d say stay away from weak linking as it means adding non-standard stuff to your producion C code. You can mix and match these techniques. Let me know how this works for you or if you know some other solutions to this problem. Have you had a hard time figuring out where to start with Test-Driven Development. What if ZOMBIES could help you build code that does exactly what you think it is supposed to do? What if ZOMBIES at the same time help you to build a test harness that can help you keep your code clean and behaving properly for a long and useful life? What if ZOMBIES could help! I’m not talking about those zombies! ZOMBIES is an acronym. Have you written unit tests only later to find they slow you down because your changes cause a lot of test breakage? You think, these tests are not living up to the promises I heard. So you toss the tests and go back to business as usual. Hey, not so fast. Maybe its not test in general, but your tests or your code. The first project I used TDD on in 1999/2000 we ran into this problem. Some were ready to give up. But I wanted the tests to work and looked for what was wrong. In our excitement we kept copying, pasteing and tweaking the test cases. They were an ugly (in hindsite) mass of duplication. Small changes made for ripple effects through the tests. But I could see, it was our fault. Someone on Quora asked me “How do you make unit tests less brittle”. Here is a more complete answer based on having written my own bad tests and seen many learners of TDD and unit testing go the wrong direction with their designs and tests. I spend the day updating the Fake Function Framework, Mike Long’s (@meekrosoft) creation. With my client last week, one of the engineers had some problems with Visual Studio (don’t we all) and the Fake Function Framework (a.k.a FFF). I promised to integrate the changes into the FFF. The FFF is created with a ruby script, but you don’t have to care about that unless you have functions to fake that have more than 10 parameters. But anyway, I spent the day updating and reviewing the ruby script that generates the FFF. Kent Beck told me years ago, if the code does not need to work, then there is no need to test it. He continued and observed, why bother writing it if it does not need to work. Since hearing that and discovering how frequently I make coding mistakes, I want thorough tests. Maybe you are asking yourself “I’ve got integration and system tests, why do I need unit tests?”. The answer is simple, simple math. 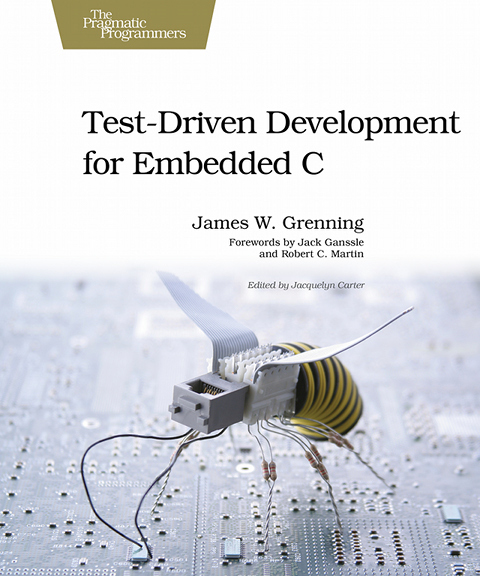 Here is a good question, and my reply, from a recent attendee of my Test-Driven Development for Embedded C training. As I work more with TDD, one of the concepts I am still struggling to grasp is how to test “leaf” components that touch real hardware. For example, I am trying to write a UART driver. How do I test that using TDD? It seems like to develop/write the tests, I will need to write a fake UART driver that doesn’t touch any hardware. Let’s say I do that. Now I have a really nice TDD test suite for UART drivers. However, I still need to write a real UART driver…and I can’t even run the TDD tests I created for it on the hardware. What value am I getting from taking the TDD approach here? Maybe you read Part 1 of this article. If you did you’ll know it concerns adding tests to legacy code (legacy code is code without tests). You will also know that the code has file scope functions and data that we want to test directly. My opinion on accessing private parts of well designed code, is that you do not need to. You can test well design code through its public interface. Take it as a sign that the design is deteriorating when you cannot find a way to fully test a module through its public interface. Part 1 showed how to #include the code under test in the test file to gain access to the private parts, a pragmatic thing to do when wrestling untested code into a test harness. This article shows another technique that may have an advantage for you over the technique shown in Part 1. Including the code under test in a test case can only be done once in a test build. What if you need access to the hidden parts in two test cases? You can’t. That causes multiple definition errors at link time. This article shows how to create a test access adapter to overcome that problem. It’s a new year; last year was a leap year; so the quadrennial reports of leap year bugs are coming in. Apologies are in the press from Apple, TomTom, and Microsoft. Trains we stopped from running in China. Somehow calling them glitches seems to make it someone else’s fault, something out of their control. How long have leap years been around? Julius Caesar introduced Leap Years in the Roman empire over 2000 years ago. The Gregorian calendar has been around since 1682. This is not a new idea, or a new bug. This is the second article addressing the misconception that TDD ignores design. In the previous article, I explained how TDD acts as a design rot radar. In this article, I’ll explain why I think TDD also acts as a homing beacon for well structured code.